A short time ago I was notified of the sudden death of Edward Michael Cardinal Egan, emeritus archbishop of New York. Following lunch, he succumbed from a heart attack and was pronounced dead at NYU Medical Center. He would have been 83 on April 2. Many will say he was brought to NY because his financial abilities. Many will criticize his warmth. He was a kind man who gave others a chance and he looked after the needy. The Holy Father asked him to shepherd the Archdiocese because he had the ability to lead men and women to the Lord. In 1957 he was ordained priest, in 1985 bishop, by 1988 he was installed as the bishop of Bridgeport and then translated to New York as the 9th archbishop on 19 June 2000. 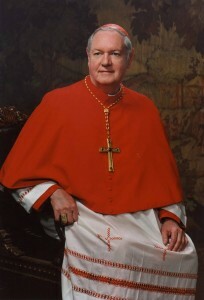 His service to the Church included being given the title of Cardinal on 21 Feb 2001. He retired on 23 February 2009. I’ve known +EME since 1997 and have always enjoyed his friendship and counsel. Eternal rest grant unto him O Lord, and let perpetual light shine upon him. May his soul and all the souls of the faithful departed through the mercy of God rest in peace. Amen. Requiescat in pace et in amore.